After scoring six runs against Roy Halladay on Tuesday, the Yankees offense didn’t bother to show up over the last two games of the series, scoring four combined runs against soft tossing Jamie Moyer and Kyle Kendrick. As a result, the Yankees dropped another game to the Phillies and ceded their World Series rematch to the National League champs. 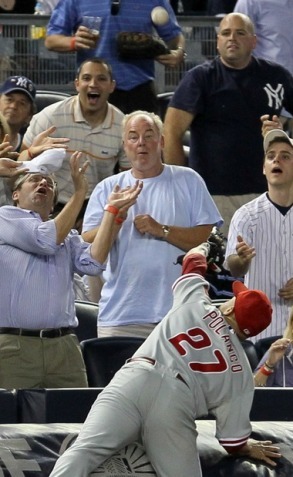 Placido Polanco braces for a diving catch, which extinguished the Yankees only real threat in the ballgame. For the first three innings, Andy Pettitte was able to match zeros with the Yankees’ anemic offense, but a Ramiro Pena error in the top of the fourth helped set up the game’s first run when Ryan Howard singled through the fist base hole. For some reason, Joe Girardi decided to take the shift off, curiously assuming that Howard would not stay true to his tendency with men on base. That faulty logic cost the Yankees a run because Howard’s ground ball would have otherwise nestled into Cano’s waiting glove. In the top of the fifth, Charlie Manuel helped his team create two more runs when he employed a hit run with Carlos Ruiz on first. By avoiding the double play with the light hitting Wilton Valdez at the plate, the inning was extended, allowing Shane Victorino to increase the Phillies lead to 3-0 with a two run blast off Pettitte. The Yankees did get back in the game briefly when Robinson Cano’s two out RBI single scored Mark Teixeira, but the rally died when Placido Polanco made a diving catch over the tarp on Nick Swisher’s foul pop. In the top of the seventh, the momentum seemed to shift back to the Yankees when Pettitte pitched out a base loaded, one out jam, but the offense could never pick up any traction against Kendrick. Instead of leaving an effective David Robertson in the game after he retired the side in the eighth, any last hope for a ninth inning rally was extinguished when Girardi once again engaged in a game of bullpen roulette. Also, after Carlos Ruiz led off the inning with a double against Joba Chamberlain, Manuel took advantage of Girardi’s foolish use of the wheel play on a bunt attempt with a man on second. Valdez’ single up the middle scored Ruiz and effectively put the game out of reach. For good measure, however, Girardi cycled through Damaso Marte and Chan Ho Park before the inning ended with a 7-1 Phillies’ lead. All of the goodwill from Tuesday’s victory over Halladay was dissipated by lackluster efforts in the final two games of the series. Of most concern, Alex Rodriguez continues to look like a compromised player, which is bad news for an offense suffering from absolutely no depth. Making matters worse, Derek Jeter and Mark Teixeira have fallen back into a slump, which has left the lineup excessively dependent on Cano and Nick Swisher. If Arod does not show signs of rounding into full health, Brian Cashman needs to quickly swing a deal to compensate for the lack of depth that has resulted from his offseason maneuvers. In the meantime, the Yankees need their bats to awaken against the surging Mets to avoid suffering further embarrassment over the weekend.